On 24 November, 1675, Dhan Guru Tegh Bahadur Ji was beheaded in public at Chandni Chowk. Along with Guru ji Dhan Bhai Sati Das Ji, Dhan Bhai Mati Das Ji and Dhan Bhai Dyala Ji gave the most supreme Sacrifice for the protection of the most fundamental of human rights – the right of a person to freely practice his or her religion without interference or hindrance. He not only gave his life to protect the Hindu religion but the whole World from converting into Islam. This is why Guru Tegh Bahadur is also known as (Tegh Bahadur, Hind Di Chadar” (Tegh Bahadur, Protector of Hindus). 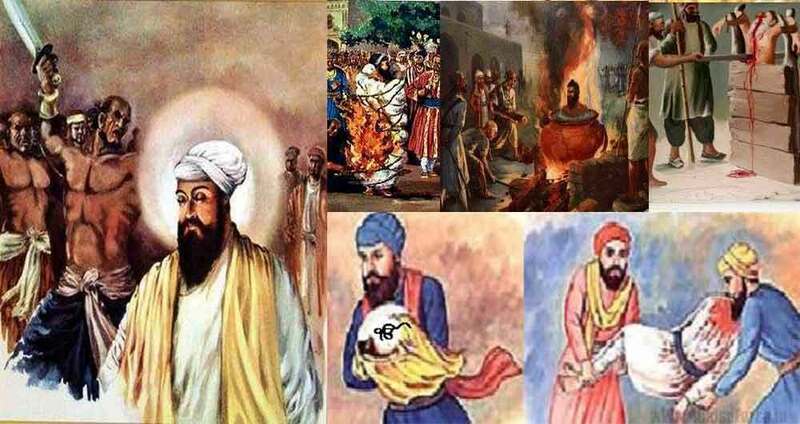 Guru ji sacrificed themselves for the freedom of a faith being persecuted under the tyrannical Mughal regime. Bhai Dyala Ji (boiled alive) also sacrificed their lives on this day after refusing to convert to Islam under mughal emperor Aurangazeb’s orders. Let us remember the sacrifices of these great Sikhs, and do ardaas that may Waheguru give us courage and strength so we can follow in similar footsteps to give sacrifices ourselves for the freedom of our own faith. Previous post Nabha JailBreak | Indian intelligence Services are Silent on Escapee Bhai Kashmir Singh | Parents are Concerned about his life | False Police Encounter.